The outer side of the lid of this equinoctial dial has an engraved coat-of-arms framed in foliage. The inner side has a table of cities and their latitudes. The hour circle is numbered 1 to 12 twice and has a folding gnomon and a brass arm for adjusting the latitude. 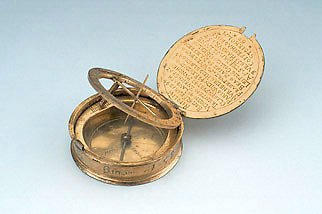 The box contains a compass with 32 directions, with the cardinal points named 'Septen', 'Oriens', 'Meridie', 'Occidens' and on the left an equal scale for latitudes marked 30 to 60 by 2, numbered by 10. The bottom of the box is engraved with a face enclosed in a shield and with an inscription on the border, reading 'WEN ICH COMPAST DIR RECHT SOL WEISEN SO HALT MIR VON STAHL VND EISEN'. On the edge of the dial is engraved the date 1584 with a Greek inscription wishing long life (Latin transcription 'Ora telos makron bion').